From the moment we arrived at the park, the traffic to get into the parking lot was immense! I know it was rush hour, but rather than having thousands of cars wait in line to go through 8 parking gates, why not bring the parking gates to them. Deploy 8 mobile parking guards to collect payment and slap a fat “sticker color of the day” on the windshield to let the parking gate attendee know “This one has already paid, and he isn’t using a sticker from last week!” Pre-pay online with express lanes is also another way. ‘But people can wait, they will be waiting when they get in the park anyway.’ That’s the problem Mr. Owner, if we start off with that mentality, how can we generate an awesome user experience for our guests? Next on the list, is another line that was atrocious. The one getting into the actual park. The good ole’ security check. The Six Flag’s employees don’t really let you know, but those lines are pretty much like playing a game to gamble for who gets in faster. You could be in one line and wait 30 minutes or in another and get in within 5 minutes. Why is that? Since the lines aren’t roped off, you get 3 or 4 lines converging into one security check point. Mr. Owner you didn’t expect people to act as civilized and fair as possible standing in a single file line did you? Another thing that takes awhile is whether you have a bag or not, since security has to check what is inside. This is why lines for people without bags would do well. This will allow people without all the extra baggage to get into the park as quickly as possible. Most people come in groups so they wouldn’t really want to break away from each other, or would they? Imagine delicious aromas pouring through the gates, comming from mobile carts/stations. Refreshing drinks due to all the heat, walking, and waiting you had to put up with just to get into the park. Imagine characters greeting you, so there in fact is something to do while waiting for friends/ other family members come through. All of this amounts to money, the one thing you love so much that you could give 2 shits about how your customers experience your park after they’ve paid for their tickets and parking. This list of rants is getting a little long so I will end with one of the most disturbing and challenging parts of being an amusement park operator, the lines (notice how we have a recurring theme going on here). The lines to get on a ride were absolutely atrocious, I was able to ride 3 rides total having stayed at your park for 10 hours, how does that make any sense? 2 ½ Hour wait for a 20 second super man ride. 1 Hour of which was because I chose the wrong side to wait on. 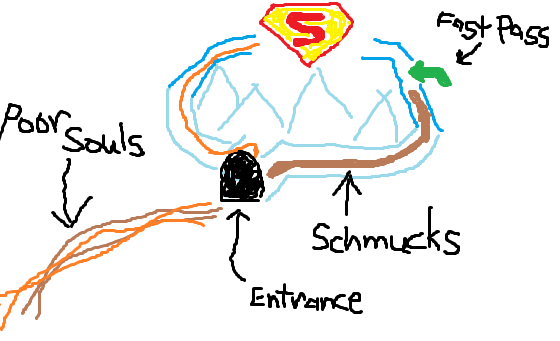 The way the Super Man line works is before you enter this icy-cool cave that leads to the ride they give you a choice, go left or go right. Unfortunately if your a poor schmuck like me, you choose the right side which moves 3-4x as slow because they filter in ‘fast pass’ guests through that side. So basically the result of this setup was, the schmuck’s line would never progress as long as there are fast pass users waiting in line. Rather than throttling the fast pass users in (oh noe! I have to wait 5 minutes instead of 1) they let them in full blast, causing the schmucks line to take 2 ½ hours total just to get on the ride.